This little guy was one of the hummingbirds that kept zipping by as we were having breakfast at the Revelstoke KOA. It was our last day in that campsite and we decided to avail of the camp's all-you-can eat pancake breakfast. Since we would be on the road afterwards, we had our camera gear out. As soon as we heard these birds "humming" around us, my son and I quickly grabbed our cameras and started shooting away. I really like this shot - the lovely bright colours certainly give it some 'punch'; but what I like most is the crisply focussed hummingbird set against a nicely blurred background. I'm guessing this was taken with a digital SLR rather than a compact, and shows the advantages of digital SLR cameras. 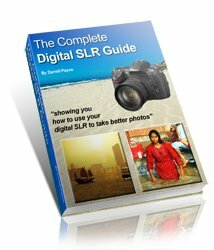 Another advantage would be the speed with which digital SLRs can focus and the shot-to-shot speed. I'd say that speed is essential in trying to capture a hummingbird! I like the sharpness too, but what I think I like the most are the blurred wings. 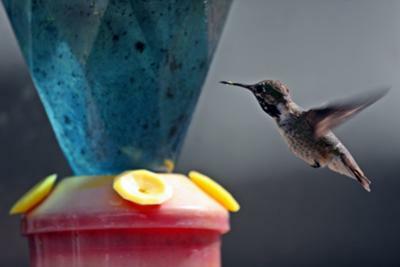 I mean, it's awesome you got the exact shooter speed to freeze the hummingbird and get that nice effect on the wings. On the other side, I'd have liked a smaller shooter apperture to get the feeder in focus. But as we can't have everything (I mean, you can't start changing the ISO in a hurry!). I will have to say this shot is really good.